This Little Havana gem has given me the motivation to get back into writing about restaurant experiences. 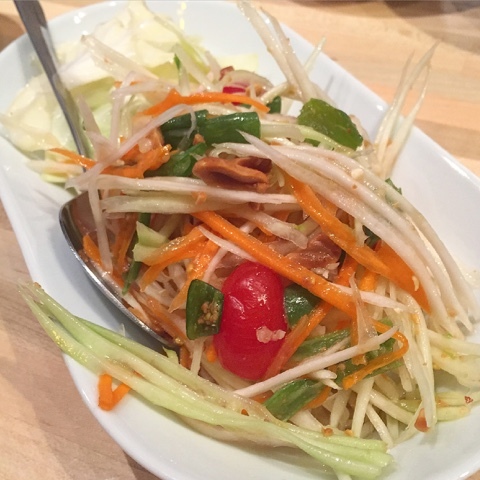 Nestled in a neighborhood known for some of the city's best Central and South American restaurants and located on a street rich in Cuban history, Lung Yai Thai Tapas has won me over. Maybe it's the small open kitchen or the coziness of the indoor eating area. Perhaps it's the fact that the Chef Bas has a personality ten times bigger than his physical frame. Whatever it is, I'm hooked. 1. If you get there after 6:30pm once it gets busy, patiently stand by the door and wait to be greeted. If they are slammed, you'll find the sign in sheet by the window ledge. Sign your name and wait quietly. 2. Do not hold the door open or block the door while you wait. 3. The counter is NOT first come first serve. If for some reason you walk in and find an empty stool, DO NOT walk up and help yourself, under any circumstance! Wait by the door. 4. There is no delivery. 5. Take-out is only offered between 5pm-7pm. Do not show up at 7:15pm asking about take-out, it will not happen. 6. There is no saving seats, at all. 7. You'll be sat and served once your entire party is ready to be seated and not a minute earlier (revert back to rule #6). 8. Do not walk up to the bar and ask for a beer while you wait. Just don't do it. 9. When the chef yells at his staff (which happens regularly) just look down and eat your food. Do not make eye contact with staff. It's like when mommy and daddy would fight at the dinner table and you didn't know what to do with yourself. 10. Don't ask about dessert options. *Follow the rules and try to see the dining experience as "dinner and a show." Now that we've got the un-pleasantries out of the way, lets talk about the food. Simply put, EAT EVERYTHING. The food at Lung Yai is the reason why you abide by the above mentioned rules. Unlike so many "Thai" restaurants in Miami, Lung Yai's food options actually offer a lot more than just thai curry and sushi (that's not even Thai btw). Sure there's thai curry on the menu, but that's just about 1/8 of the options to choose from. Eventhough their curry is delicious, I implore you to venture out of your Thai comfort zone and go for the dishes you've never heard of. With every visit to Lung Yai Thai Tapas comes new dishes that I love. You could easily order all of the appetizers and have yourself an amazing meal. 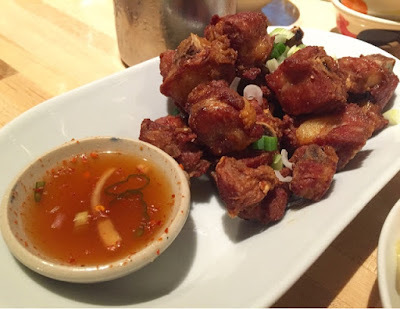 Pork dumpling (steamed or fried), fried chicken wings, papaya salad and the duck salad are just a few of my favorites. 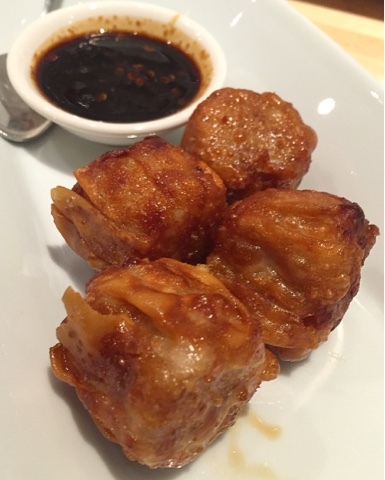 The pork dumplings are made fresh every day and are delicious both steamed or fried (I prefer fried). When I like to pretend I'm on a diet, I go for the steamed and when I am in my "It's my hot body, I do what I want," mood I go for fried dumplings. 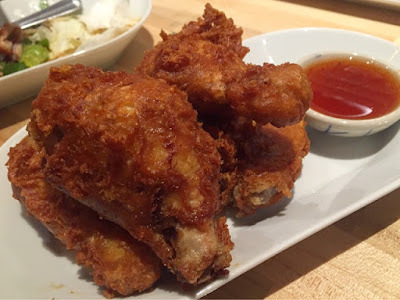 The fried chicken wings are so damn crunchy, tasty and juicy. Slather your wings in some of the chef's special sauce #HeyNow for an extra spicy kick. Talking about spicy, the papaya salad is a refreshing yet tongue tingling Thai staple that gets made right infront of you at Lung Yai. 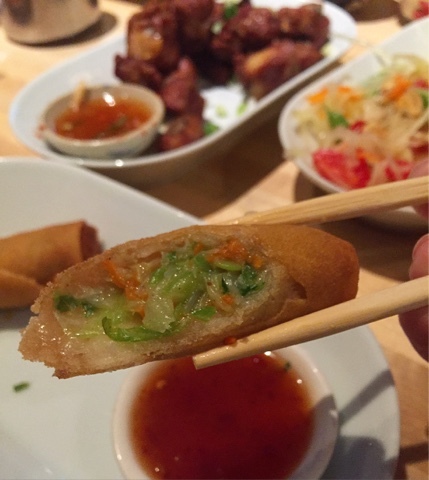 The crispy spring rolls, roasted baby back ribs and crispy duck salad are also must haves. 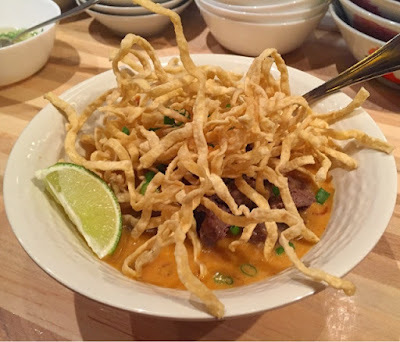 Some dishes that have quickly become entrée favorites for me include the Khao Soi Gha, Palo Moo and the Duck Noodle Soup. Khao Soi Gha is freshly made egg noodles in a golden curry topped with fried crisp noodles, onions and your choice of protein. The Palo Moo is a pork stew of sorts that comes with slow cooked pork, pork belly, tofu, mushrooms, boiled egg in a slightly sweet aromatic broth. The Duck Noodle soup is what I like to call Asian chicken noodle soup on fleek. 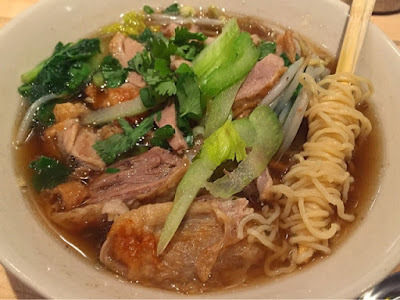 Actually, reducing the duck noodle soup to chicken noodle is an insult. The duck is perfect cooked, the broth is delicious and the duck skin manages to sustain some of its crunch even while in the soup. There isn't an entree on the menu that you can go wrong with. Like I mentioned in the rules, don't ask about dessert. Sure this place requires a bit of patience and an ability to follow the rules, but I assure you the food is well worth it. I encourage diners to get there before 6:30pm, any time after that will require a lengthy wait.